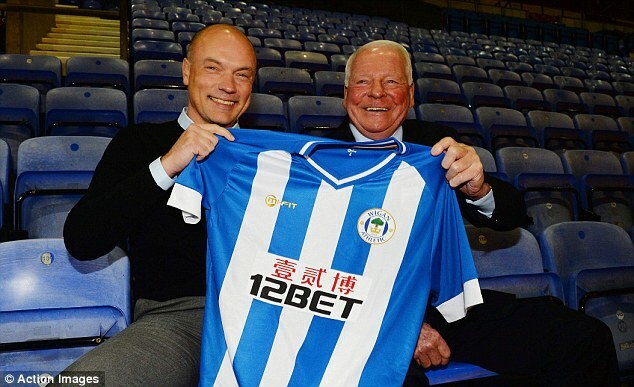 Despite an awful run of form resulting in the club’s lowest league position in the better part of a decade, the formal unveiling of new boss Uwe Rosler at the DW Stadium earlier today appears to have injected a welcome breath of positivity at Wigan Athletic. Flanked by chief executive Jonathan Jackson and club chairman Dave Whelan, the German hit all the right notes during an insightful half hour press conference. His approach serious and considered, Rosler did much to suggest he will embrace the groundwork set in place at the club by Roberto Martinez, while tweaking the finer details in playing style to suit his own brand of football. He referenced a high-tempo passing and pressing game employing a 4-3-3 formation, similar in some ways to the Spaniard’s preferred system, but different in others — hinting that there would be an emphasis on pace and energy, and a commitment to pushing bodies forward in attack. Although we will have to wait and see exactly how these changes manifest themselves, the comparison between the Martinez and Rosler blueprints does not sound far off the transition Swansea underwent from Brendan Rodgers tikki-takka to Michael Laudrup’s skill-based but more direct approach. Whelan once again commented on the hiring process, reiterating the goal of a Premier League return as soon as possible, and backing his new man to be a huge success at Wigan. When asked about specifically about Callum McManaman and James McLean, Rosler described them each as exciting, fast and direct players that would fit his system, while reserving a diplomatic word about room for improvement in McLean’s final pass. He also opined that the change in management and style, plus the fixture congestion with the club taking part in the Europa League group stages, posed huge challenges to the club earlier this season. There was a quiet resolve and confidence about Rosler’s delivery that is already generating optimism amongst supporters on social media outlets. The hope is that he will be able to swiftly convey it to his new players and that such desire will manifest itself on the pitch in coming weeks. His description of the opportunity as a “dream” to join “such a big club” will likely please many but also felt genuine, while his long-term views and discussion of player development suggest he is in it for the long haul. More immediately, he made it clear that next weekend’s Championship fixture against Bolton will be the priority, but that the midweek trip to Maribor was a winnable contest. It should also provide him a good chance to get to know some of the personalities in the squad as the Latics embark on their final Europa League group stage adventure as a squad. Interestingly, the new manager spoke about having developed a relationship with Martinez since Rob Kiernan joined Brentford on loan in 2012, but confirmed that he had not consulted the Spaniard before taking the position over the weekend. In a curious twist of fate, Martinez himself was today in Wigan being honoured at Wigan’s “walk of stars” for his achievement in winning the FA Cup last season. Chairman Whelan, also being honoured at the event, was several minutes late to the press conference as a result. All of which may have been pure coincidence, but you do get the sense that this was an appointment made with Martinez in mind. Whelan was displeased by Coyle’s rejection of the style his predecessor had spent three years implementing from the youth teams all the way up through the first team. With this appointment, the chairman has made clear his hope for a period of evolution rather than revolution at Wigan Athletic. ← Another European manager for Latics?